Electropolishing chemical & plant which gives mirror bright Stainless Steel metal surface without buffing. 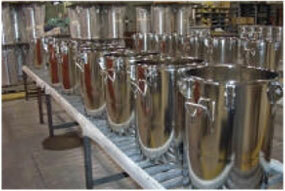 Electropolishing is a reversal electrolysis process. Material from the surface of work piece is removed uniformly leaving a bright and smooth surface finish. Surface of the components is enhanced by treating with given solution and applying appropriate electrical current. Electropolished surfaces are chemically passive, free from burrs and microscopic cracks. This process gives improved corrosion resistance and durability. This process giving smooth effect reduces friction and wear of two different forms of materials. Electropolished components are easy to clean and it helps reducing bacterial growth. It is also used for exposing built in material or manufacturing faults. Compatibility for welding, soldering and to achieve high vacuum is assured. full accessories – fixtures, training to workers and testing of used solution for E-Polish 210. “NOVEL” UNDERTAKES ELECTROPOLISHING CONTRACTS ON JOB WORK BASIS AT THE SITE FOR LARGE EQUIPMENTS LIKE SS REACTORS, TANKS ETC.